Back of the Cereal Box: Undercooked? Oversalted? Swimming in Vinegar? I realize that certain people must avoid spicy food for medical reasons, especially when they’re confined to airplanes and the tiny bathrooms therein, but I feel like referring to these peoples’ meal preference of choice as “bland” is just hammering home the point that they can’t enjoy good food. It’s kind of like places where unmarried women still have to identify themselves as spinsters on legal forms. 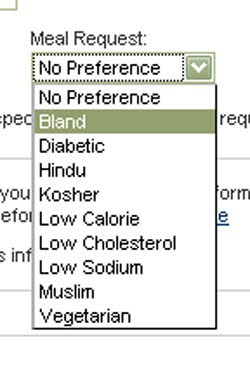 Also, should I be surprised that they have “bland” but not “vegan”? Or would vegan be covered by one of the other options? What about “gluten-free”? Or is that covered by “bland”? This story's surprising ending? We were not given any meals. The meal selection option seems to be a vestige of the days when air travel was just a little bit more luxurious.